What could be better than a little bread ball with a gooey, cheesy center? I saw this fabulous recipe posted by Zerrin from http://www.giverecipe.com. Her recipe was not only easy, it was fantastic. If you want to see her recipe, click here. I made the dough as she stated, with one difference. I didn’t have mineral water, so I used club soda. In her post she states that mineral water works best to make the dough fluffy, and she may be right. Her pogacas do look fluffier than mine. Next time I will take her advice and use the mineral water. For the filling I made half as she stated (feta and parsley), and I made the other half with feta, parsley and added a bit of ricotta and gouda cheese. Mark and I liked the ricotta mixture. The ricotta made it creamier, while the gouda gives it the melty-cheese factor. And of course the feta is essential for the salty goodness. Per Mark’s request, next time I am also adding a bit of mozzarella cheese. I love this recipe, and in the future I am going to play around with fillings…the possibilities are endless! Note: mineral water is fizzy water. The bubbles makes the dough light and fluffy! UPDATE: these are fantastic even a few days later. They also make a great slider appetizer by placing a piece of grilled chicken inside (Mark’s idea). Like I said, the possibilities are endless with these! This entry was posted on July 27, 2010 at 12:00 am and is filed under Turkish with tags balls cheesy, bread, cheese, filled, pogacas. You can follow any responses to this entry through the RSS 2.0 feed. You can leave a response, or trackback from your own site. these look fantastic! I definitely think it would be hard to have just one! I’m very glad that you love my recipe. Your pogacas look absolutely fantastic! I’ve no experience with club soda, but mineral water really works. I love your fillings, too. A melting cheese must be even better as you show in the picture. Amazing! 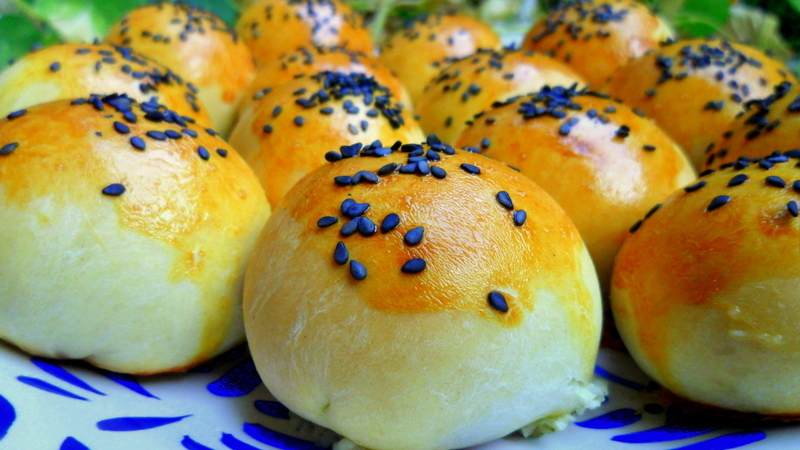 I love the blue poppy seeds on top, they gorgeous and gives the bread a bit of color. Mm! Congrats on making Foodbuzz Top 9! These rolls look really tasty! Congrats on Top 9! This look great. 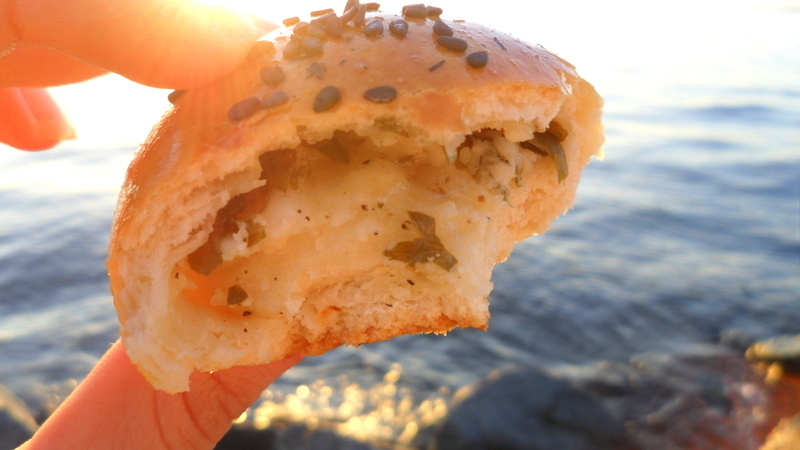 ‘What could be better than a bread ball with gooey cheese?’ How about another one! 🙂 Great photo – these look amazing! Yum! I’ve never used sparkling water in a dough recipe so will have to give it a try. Wow@! Go girl – with that top 9 and a gorgeous photo…love it! Glad they turned out so well for you! These look really delicious! In Serbian cooking we use mineral water or soda water for certain kinds of bread. The name “pogaca” I guess is the same in Turkish and Serbian (we have a lot of words in common, due to the Ottoman rule of the Balkans). Congratulations on Top 9! Well deserved. My dear Cousin. We are so Proud of you!! I can say that I have tasted your wonderful Baking and your Cocktail Drinks, not just have followed your recipe but have tasted them when you’ve made them for us.. and they are wonderful. I am so happy you have found a passion for cooking, Something We both enjoy. Congratulations on making it on the Top 9. An Attorney, Baker, and a Chef. Awesome.! I look forward to your next adventure/Recipe to make them at home. Well, I think you are the real cooking genius, Jaime the cocktail genius, and I am the baking genius…perfect components of an awesome restaurant, don’t you think? Dumb question: I am dying to make the recipe – how do I print it off? Hi Dana. The recipe is actually not on my blog. Click on the give recipes link and it will take you to the recipe.